Wufoo is a leading application in DIY form building. It enables you to create online forms to collect leads for your business without writing any HTML code. 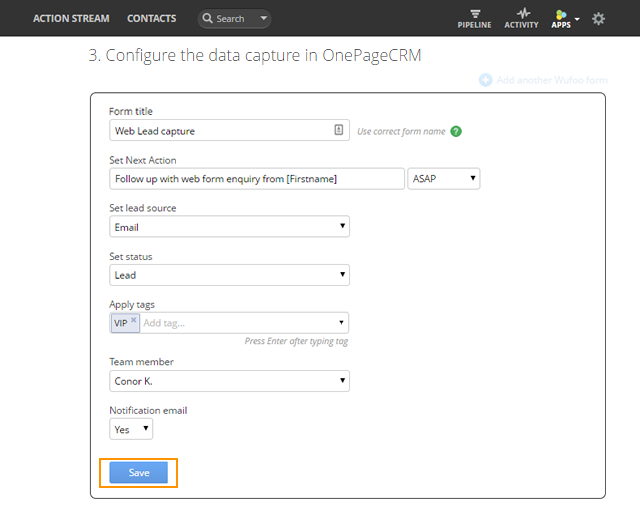 You can now link your contact us form directly to OnePageCRM using Wufoo and act on the leads immediately. 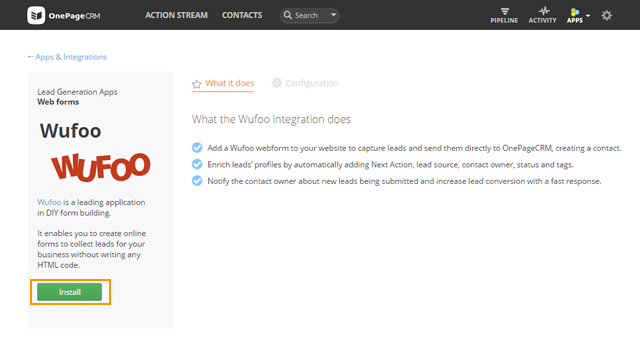 Go to Apps → All Integrations → click on Wufoo under the Lead Generation Apps category. On the Wufoo page, click on the Install button to enable this integration. Once this integration is installed, you're brought to the Configuration tab. Login to your Wufoo account or create a new account → click the + New Form. Enter a form title and add the details you want to collect and save the form. Go back to your OnePageCRM account and on the Configuration tab → Connect Wufoo to OnePageCRM , copy the Webhook URL and Handshake Key. Access your Wufoo account → go to the Forms menu on the top. Click the Edit drop down beside your form name and select the Add integrations option . 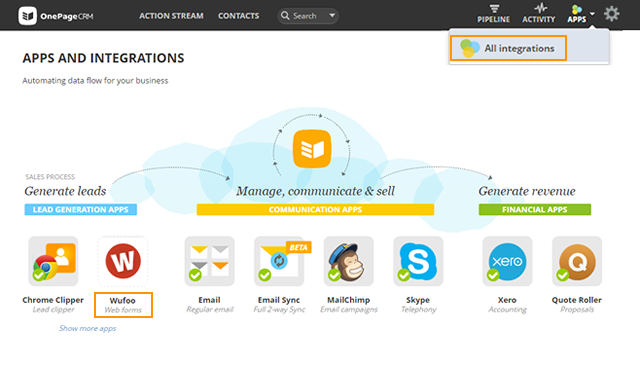 Select WebHook from the drop down and click Add Integration . Paste OnePageCRM's WebHook URL and Handshake Key into the corresponding fields. Select the Include Field and Form Structures with Entry Data check-box (required). Click Save to connect OnePageCRM and Wufoo. Enter the Form title. Note: Form title must exactly match the name of the form in Wufoo. This field is required and case sensitive. Set Lead Source by selecting an option from the drop-down list. Set Status by selecting an option from the drop-down list. Assign a form to a Team member from the provided drop-down list. Set Notification email to either Yes or No, if you wish to be notified by email after each form submission. 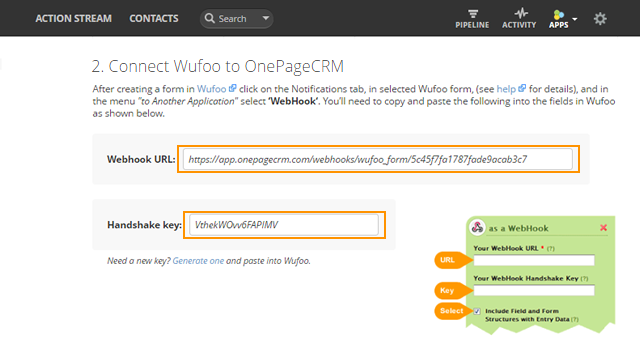 To link another form to your OnePageCRM account click on Add another Wufoo form and follow the configuration steps above. Note: You can have multiple Wufoo forms running at the same time. 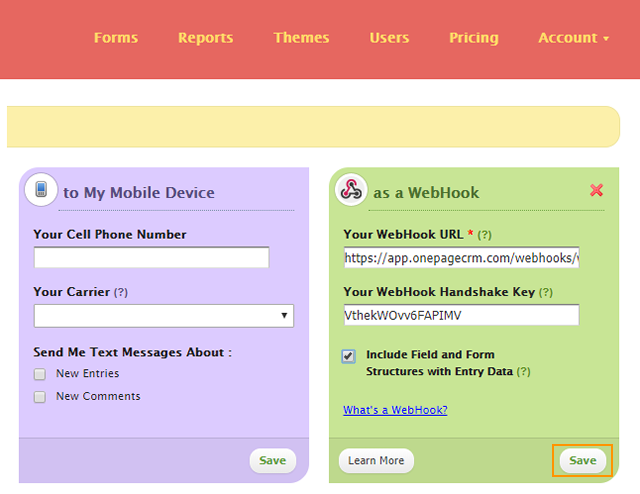 To edit a Wufoo form click on the pencil icon in the top bar of the form, update the settings and Save. To delete a Wufoo form click on the bin icon in the top bar of the form and click OK in the warning message. To pin the Wufoo integration to the Apps menu, select the check-box: Pin to the Apps menu. 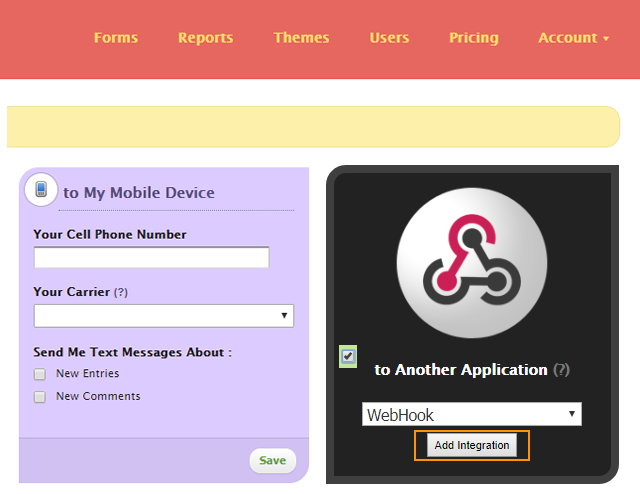 Wufoo integration can be enabled and configured by the Account Owner or Administrator user. Wufoo have updated their terms (September 2017) which means this integration is only available if you have a paid plan with Wufoo. 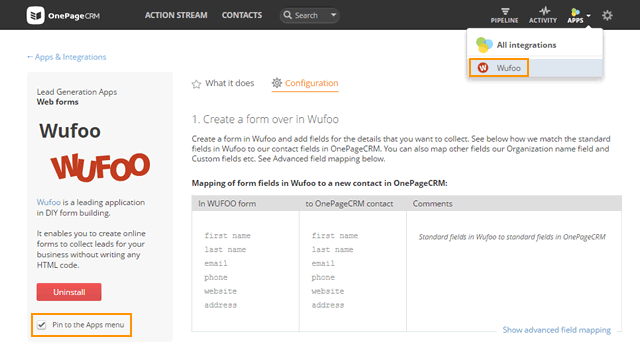 OnePageCRM can also transfer uploaded attachments to forms, which is also a feature of Wufoo paid plans only. Standard fields such as First name, Last name, Email, Phone, Website, Address in OnePageCRM are automatically matched to the standard Wufoo fields. If you add a Text field and label it Company, Organisation or "Organization" in Wufoo, we will map that field to OnePageCRM's Organization field. If you add a multi-line text field and label it "Background" in Wufoo, we will map that field to OnePageCRM's Background field. If you create field labels in Wufoo with the same name as Custom fields labels in OnePageCRM, we will map them. Make sure that you match field types for these in both apps for example Single line text to Single line text, Date to Date fields etc. All the form fields that are not matched are stored as a Note with a contact.